This one of a kind condo is located on the fourth floor of a classified monument in the center of Bruges. There´s no apartment in the center with a higher vantage point. The tower is part of the property with access from the living room and gives a magnificent view over the whole city. (The tower should only be visited by children when in the company of adults). Hardwood floors throughout with carpet in the bedrooms. The apartment has all the latest amenities as it was just completed in 2010. A full bathroom in the master bedroom suite with a separate shower and half bath for the other bedroom. Bathroom has heated granite floor. The apartment has air conditioning . Latest Bose stereo/DVD system with IPOD connection and plasma screen and outdoor speakers on the patio. The terrace has outdoor seating with a beautiful view looking West over city towers. Outdoor speakers and a BBQ complete your outdoor experience. The open stainless kitchen has all one needs to rival the local chefs but several excellent restaurants are just outside the door. The premises have free wireless high speed inter net and digital cable as well as a WIFI printer. Longer terms can be discussed and are negotiable. The rates include a cleaning fee and all linens. We require a 500 Euro damage deposit at check in which will be returned at check out. This is our own 'pied a terrre' in the city where we grew up. This building has been in the family for over 75 years and we are particular in the guests staying in our home. Everything is high end and you will find the luxurious beds and quiet location a great plus after walking and exploring this wonderful city. The appartement has full A/C which is really necessary in the summer months and which is not a given in other VRBO accommodations in the city. We hope you will enjoy the place as much as we do and respect the other owners in the building. the property has been in our family for three generatons and we return a couple of times a year to our home town. This is a very unique property with all the modern amenities a discerning traveler expects. A classified historical building located in the heart of Bruges. located in the center of town . 2 minutes to the theater and 5 minutes walking to the square or city hall. 20 minute drive to Knokke and the beautiful beaches of Belgium. on a clear day you can see the coast line from the terras. 1 parking space on the courtyard secured by electronic gate. high speed wireless installed in 2011 with wifi printer. State of the art open kitchen with dishwasher and convection oven refrigerator and seperate freezer . 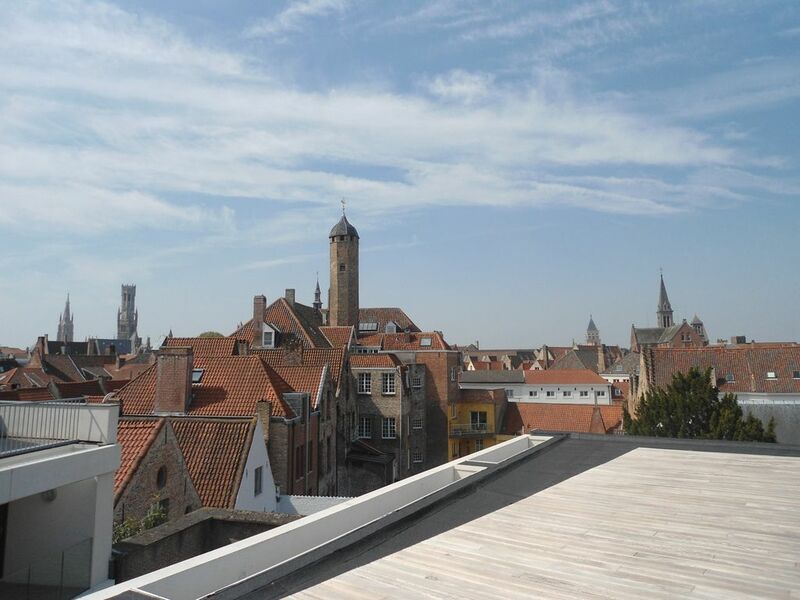 Brand new apartment with new appliances, indoor/outdoor stereo system, 50´inch plasma, direct private access to tower overlooking the city of bruges and sunny terrace. We loved everything about our stay at this wonderful apartment. It was meticulously clean, the beds were comfortable, communication with the owner was easy, the location was great, and the apartment was beautiful. We came here mid-way through our 2 week vacation, and it was great to have a Miele washer and dryer to do our laundrey. We loved the tower! The views from the tower at sunset were exquisite, and were an important part of our adventure in Bruges. I highly recommend this place! Even though I have already done this once, I will again say what a wonderful vacation we had in Brugge and our condo rental could not have been better. From our helpful and attentive manager, Sophie, to the incredible condo and all its amenities and best of all the location in a quiet neighborhood, yet within ten minute walk to the central square. The restaurants, the shopping, the museums, the music, ( we attended a concert by the National Orchestra of Flanders in Brugge's new amazing concert hall), the canals, the architecture and Brugge's fascinating history, all made our nine day stay not enough. Everything was excellent - the beautiful apartment, the manager Ms Sophie Vertongen very friendly and helpful, the superb cuisine and wonderful weather. And unforgettable Brugge, of course. Gorgeous condo and perfect location! This condo is gorgeous with everything you need. The location is pefect quiet area but within walking distance to everything. It's on the top floor so you have the choice of using a small elevator or climbing a lot of stairs. The views from the condo are wonderful. Sophie was also very helpful. I recommend this condo as a place to stay in Bruges! I'm glad you had such a wonderful time at our condo! We would love to welcome you back in the future! The apartment was very well furnished and met all of our expectations. It was clean, comfortable and in a very safe neighborhood with a great location. We stayed 5 nights and used it as a base to visit many other parts of Belgium. Bruges is best in the evening when most of the touring hoards have left. The apartment comes with a parking spot that made it easy to come and go in a town with very limited parking. I highly recommend this apartment. We are happy you had such a good time in Bruges. It would be our pleasure to welcome you back in the future! Absolutely spectacular property. We've stayed an numerous VRBO properties but this one is in a class by itself. Perfect location. Quiet apartment, but close to everything. Amazing views from every room. Spotlessly clean. Extremely well equipped. Fabulous chef's kitchen with everything you could possibly need. Warm adjustable lighting. Very comfortable beds. Even better yet was our amazing hostess Sophie. Great communications before, during and after the stay. She was flexible to our arrival/departure times, meeting us at the property and patiently explaining how everything worked in this very high tech apartment. She was immediately available throughout our stay; quickly responded to our questions. Thanks to Sophie, our experience from start to finish was superb. We can't wait to return! Thank you for this wonderfull review! It will be my pleasure to welcome you back anytime! located in the center of UNESCO world heritage city of Bruges close to the beaches and the fields of Flanders. Great location to visit other Flemish cities as Gent and Antwerp. Amsterdam and Paris are a 3 hour train ride away. deposit is refundable if reservation is canceled 60 days prior to arrival. no refunds once full payment is received.